Thank You for joining me here at My Craft Spot today. 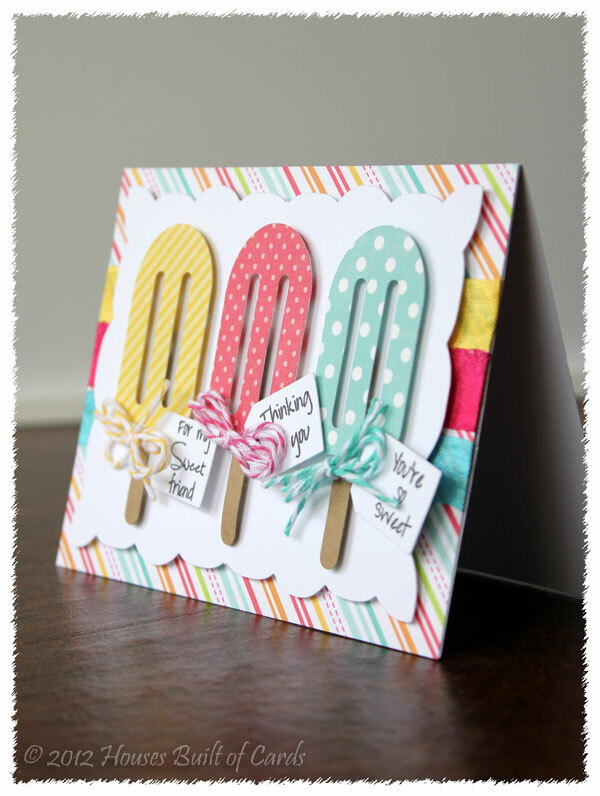 I want to share a card I made at the beginning of the week for My Craft Spot's HOT SUMMER COLORS Challenge with you. For FULL details on the challenge, click HERE. While at a family barbeque last weekend, my boys were busy chasing beautiful Monarch Butterflies and it inspired me to create a Butterfly Shaped Card. 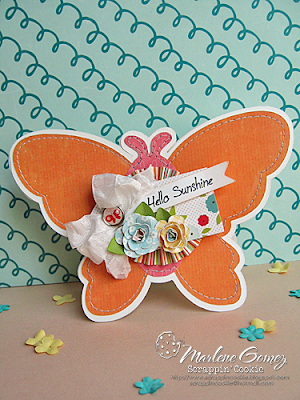 I used the Butterfly from the Cricut Craft Room Basics Digital Cartridge, cut at 4.25". The sentiment is from the My Craft Spot "Butterfly Kisses" Stamp Set. 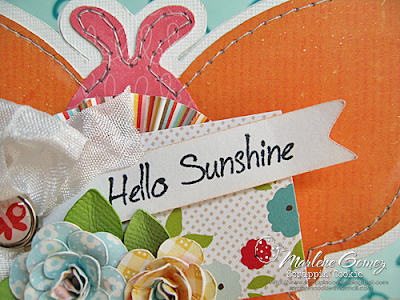 In order to get it to fit into my sentiment flag strip, I masked off the "Sunshine" part and stamped; then masked off the "Hello" and stamped. I made a quick double-loop bow with the My Craft Spot "Snow White" Crinkle Ribbon and centered it with a brad. I hope to have inspired you to use some of the amazing My Craft Spot products and HOT SUMMER COLORS on your next project. If you haven't already joined this week's HOT SUMMER COLORS challenge, there's still time!! You have until Monday, July 2nd 11:59PM MST to enter for your chance to win this week's prize! For more details and pictures on my BUTTERFLY SUNSHINE Card, please click HERE. 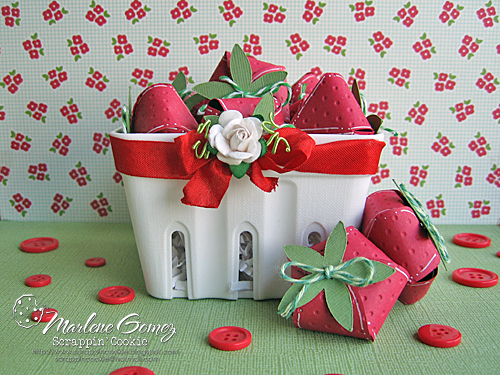 This is one of the first cards I posted on my blog and it was also published in the June/July 2011 Cricut Magazine (p. 73)! 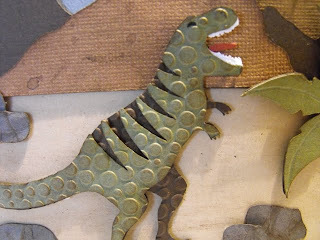 Click HERE for a picture tutorial showing how I built the T-Rex. 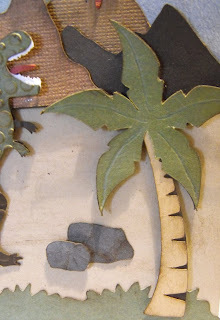 Click HERE for a picture tutorial showing how I made the palm tree. Hope you enjoyed this Flashback Friday! Have a great day!! DT post by Robin - Beach scene card! Hello everyone! This is Robin from Robin's Creative Cottage I'm excited to share my island card with you today, I used Kimberly's Inside & Out -Set #2 stamp set for the sentiments on the outside and the inside of the card. 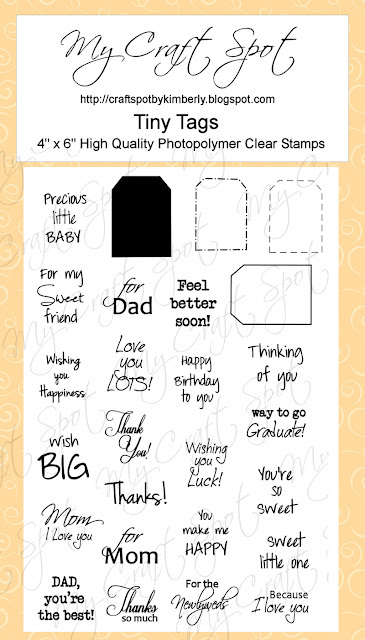 This is a great versatile stamp set for many occasions and if you like to add words to the inside of the card as well as the outside it's perfect! You can find the stamp set -HERE. I used the cricut cartridge Life Is a Beach for the images, the cloud image is from the Everyday Paper Dolls cartridge. I added inking to all the edges with the Tim Holtz Vintage Photo or Tea Dye ink pads, and for the clouds I used Jenny Bowlin Soap Powder ink. I adding a hint of stitching using my sewing machine on the "thinking of you" tab and the waves. 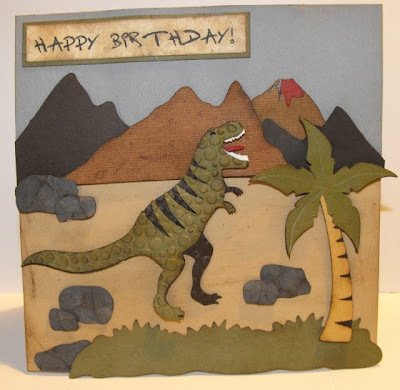 I have more photos and a video on my blog of how I made this card, come on over and visit me at Robin's Creative Cottage -HERE. Winners from Challenge # 60 - Cool Treats! 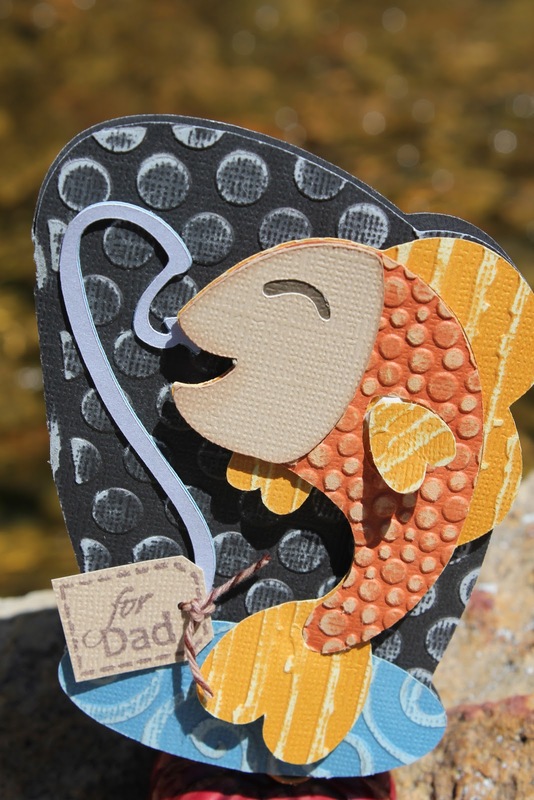 I have 2 posts for you today, so be sure to scroll down and take a peek at Gwen's fantastic fish card!! 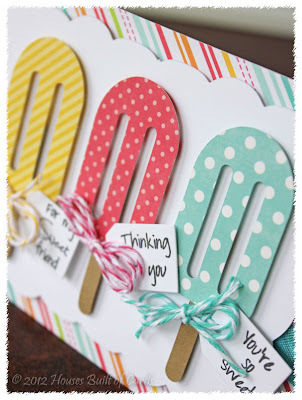 We had so much fun looking at all of your awesome cool treats projects! Thanks for joining the fun!! Congratulations # 21 - Mary W.
You won the Inside & Out #2 Stamp Set! 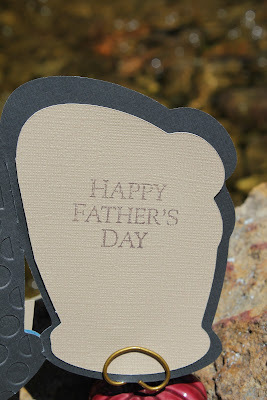 DT post by Gwen - Fun shaped card for your fisherman! Hi, this is Gwen here with a fun shaped card. I made this for my Husband for Father's Day, he has really gotten into fishing lately. In fact he just took a fly fishing class at BYU, so I mean he is really into fishing! I love this Wild Card 2 cart, it has so many fun images on it. 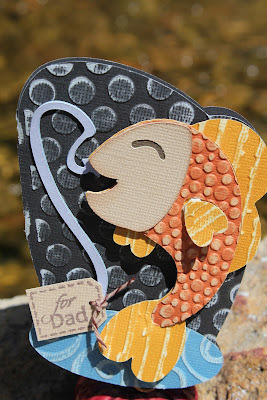 Jayne made this card and I knew I had to make one for my Fisherman! I cut it with it's layers at 4.5". I used Tim Holtz distress paper and ran it through the cuttlebug and then sanded it. I put it all together with foam tape and used the Tiny Tags stamp and Vintage Chocolate Twine from My Craft Spot. Visit my blog for more fun projects! DT post by Marlene - Thank You Berry Much! This is Marlene from ScrappinCookie! Thank you for joining me today for some FUN projects using products from My Craft Spot! My two little boys finished Pre-K and 2nd Grade last week - I know - and I made some BERRY thankful gifts for their teachers. For both "Homeroom" Teachers, I made a basket filled with 3D Strawberries with chocolate kisses inside. 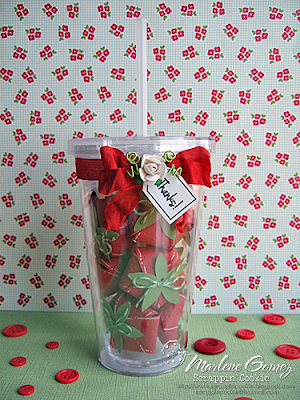 I wrapped some Red Crinkle Ribbon around the fruit container and added a small mulberry paper rose. I had a small tag using the "Thanks" Tiny Tags Stamp Sentiment, but forgot to add it. 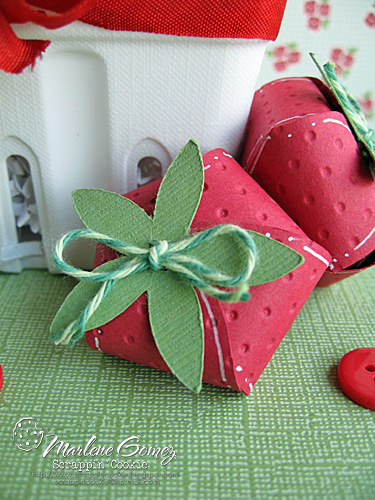 The strawberries were closed using some Twinery "Peapod" Twine. However, the picture below uses the Trendy Twine "Twisted Lime" Twine. I made another gift set for my son's Pre-K Teacher Aide. 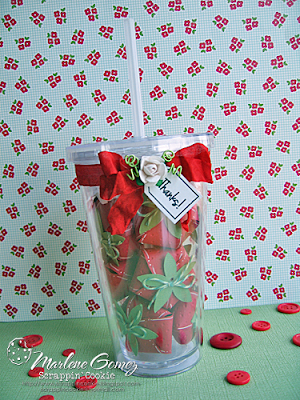 It uses the same "Berry Thankful" theme, but this time inside of a clear plastic tumbler. I used some more 3D Strawberries filled with chocolate kisses and closed with Trendy Twine "Twisted Lime" Twine. 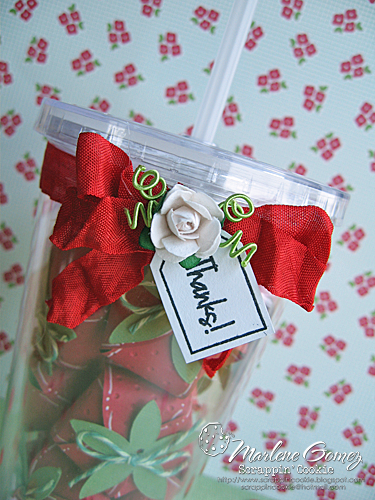 I tied some more Scarlet Red Crinkle Ribbon around the plastic tumber and centered a mulberry flower with a tag stamped with the "Thanks" Tiny Tags Stamp Sentiment. 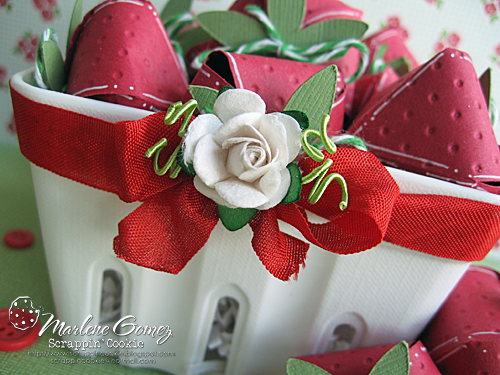 For more details and pictures on the BERRY BASKET, please click HERE. For more details and pictures on the BERRY SMOOTHIE, please click HERE. Hi everyone! I hope you are all having a fun summer and enjoying the sunshine! Are you ready for another fun challenge?! Now it's time to sit back and enjoy some inspiration from my wonderful design team!! GiGi's purse is amazing! 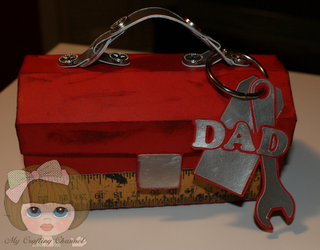 I love how she used ribbon as her purse handles and little polka dot brads are so cute! 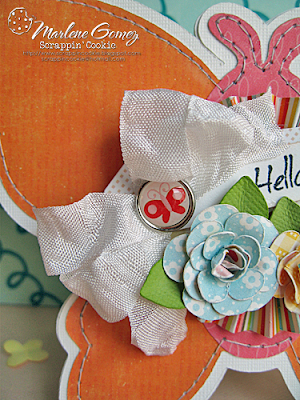 I love the cute button 'closure' and the Orange Divine Bakers Twine is a perfect match! This fun purse is actually a card holder. What a great gift to be able to give a friend! This little crab is so cute and I love Amber's fun stitched lines! 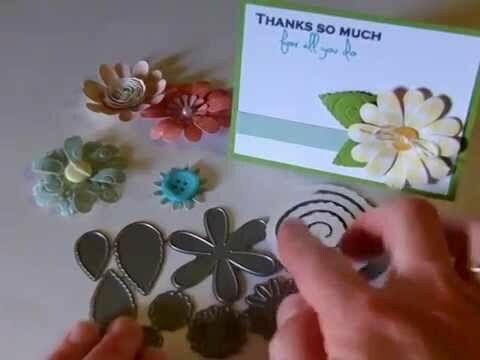 I love all of the pretty summer flowers on Robin's gorgeous pocket cards! 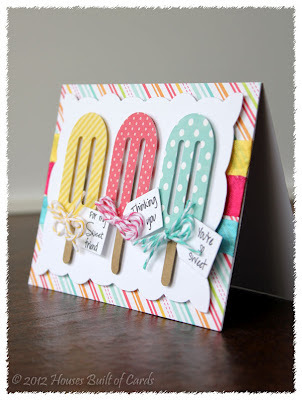 Check out Robin's blog for a video showing how to make these fun pocket cards! Heather's card is so fun! I love the great patterned papers she chose! 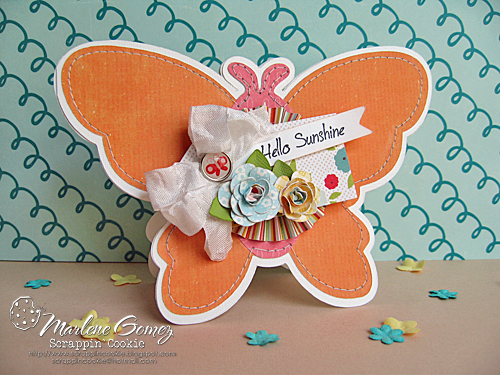 Heather used hot summer crinkle ribbon colors to make bright, bold stripes in the background! 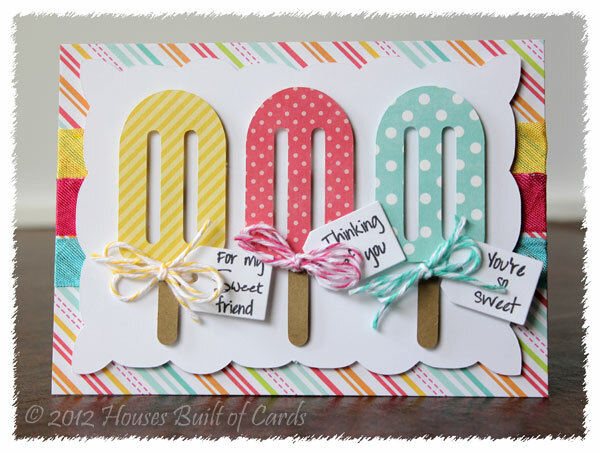 Heather used the Tiny Tags stamp set for all of her sweet sentiments. Hi this is Gwen here with a fun and super easy shaped card, I hope you like it. 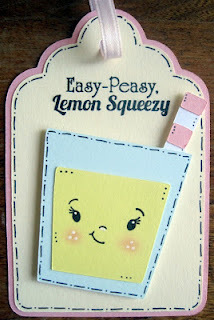 I had fun making this little shaped card, although I was covered with the fun flock, my fingers looked like that little bee! The bee is a file from SVGCuts and made in the Silhouette Designers Edition program. I made a shadow and welded 2 together for the card base. I then added fun flock to the black and the yellow parts of the bee (not the eye lids) and then glued together. The bee and his eye lids are on foam tape. The little flower is cut at 3" from Art Philosophy. The ribbon, twine and stamps are all from My Craft Spot. 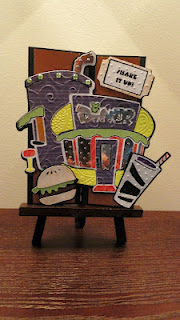 Visit my blog, This & That, for more fun projects! I originally posted this video in March 2010. At the time, there were not many Cricut cartridges with borders on them. This video shows how to design a simple border punch with your Gypsy. 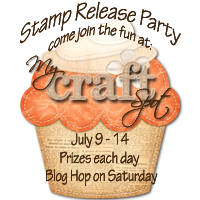 Click HERE for a chance to win some blog candy and for information about the upcoming stamp release party! Hello Everyone! This is Amber from My 3 E Scrapbooking here to share a crafty tip today with a card using My Craft Spot's Happily Ever After stamp set. A few weeks ago I posted a Baby Boy giraffe card using the set and today I have a Baby Girl card using the same little giraffe! I've been cutting several cuts at a time on my 6x6 paper sheets lately. This way, I don't have the scraps of paper laying around and I can throw a card together in no time when I need one! This card came together very quickly with a few layers, a great sentiment, a Baker's Twine bow (Twinery Pink Sorbet and Green Apple Divine) and the cute pre-cut giraffe! Click HERE to see the Happily Ever After Stamp Set. Click HERE to check out the great selection of Baker's Twine available at My Craft Spot. 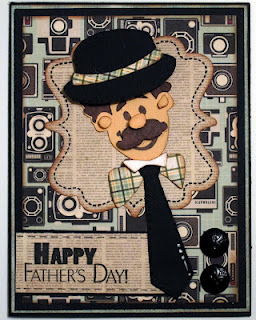 Please stop by My 3 E Scrapbooking for more details about the card and have a great day! Winners from challenge #59 - King of the grill!! Congratulations #15 - Pat N.
You won the Divine Twine Pack!! Winners from Challenge #58 - What's Your Age?! Winners from Challenge #57 - Buttons & Bows!